You’ve decided that it’s high time for garage door replacement and now you want to find the ideal new unit for your home. With so many options out there, it’s easy to get confused. Use this guide to eliminate the hassle associated with buying a new overhead door and make the best choice easily and quickly. 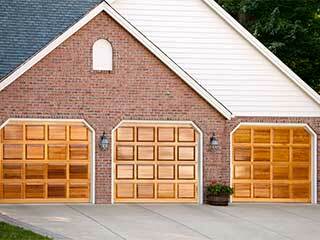 The make is very important when it comes to selecting a door for the garage. Steel is regarded as the top option because it is strong and durable and doesn’t require special care. Wood is another traditional material which more and more buyers consider. It is beautiful and strong and can last for decades, but only with special annual care. It is up to you to decide whether a high-maintenance wood door would match your needs and lifestyle. Aluminum garage doors are gaining greater popularity because they are lightweight and highly resistant to weather damage. They could be an ideal solution for homes in the coastal areas of Connecticut. The only disadvantage of aluminum is that it is more likely to dent compared to steel. Vinyl is considered to be the cheaper alternative to aluminum. Its major downside is that it doesn’t provide good insulation. It’s a mistake to overlook the structure when you choose garage door. It is basically the number of layers that a door consists of. The single-layer units are the lightest and most basic. The double-layer ones have insulation, usually polystyrene, attached to the main layer. The polystyrene has protective backing which also adds to the aesthetics of the door. The triple-layer models have the highest R-values as they have two layers of the main material, usually steel, and insulation between them. There are models with polyurethane and ones with polystyrene. The former usually have higher R-values. Besides, polyurethane is more durable and resistant to damage. There are endless design options when it comes to residential overhead doors. You may want to start with comparing the main styles. The carriage house doors look as if they are double and open to the sides and this makes them a great choice for homes with a classic architecture. The raised panel style is modern and elegant. It’s often preferred for its simplicity. If you want something ultra-modern and hip, consider a door with flush style panels which are completely flat. When you go over the catalogues with design customization options, take into account the decorative elements of your home’s facade to choose matching ones. You can’t afford to overlook the technical details, even though this is the boring part. You need to measure the size of your current unit to get a match. Additionally, you should keep in mind the capabilities of your spring system and opener when deciding on a door. If you go for a heavier unit, you may have to change these too. At Garage Door Repair Stamford, we offer a comprehensive installation services which includes full shopping assistance.